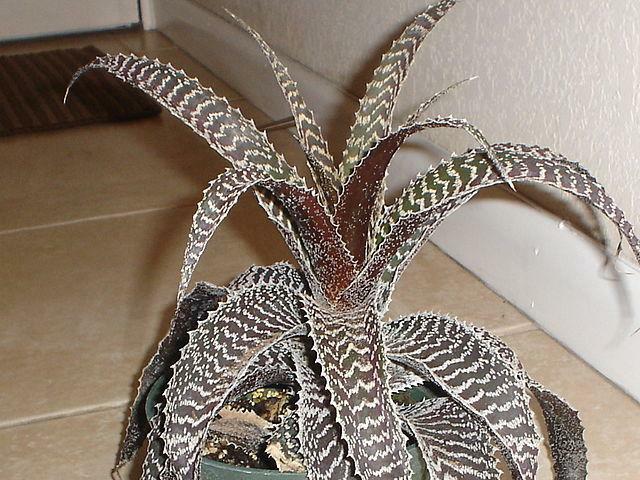 When it comes to separating a bromeliad offset, often called a pup, from the mother plant, many people develop a case of "separation anxiety." I know I did. While it isn't terribly difficult to do, there are some basic guidelines to follow in order to achieve success. 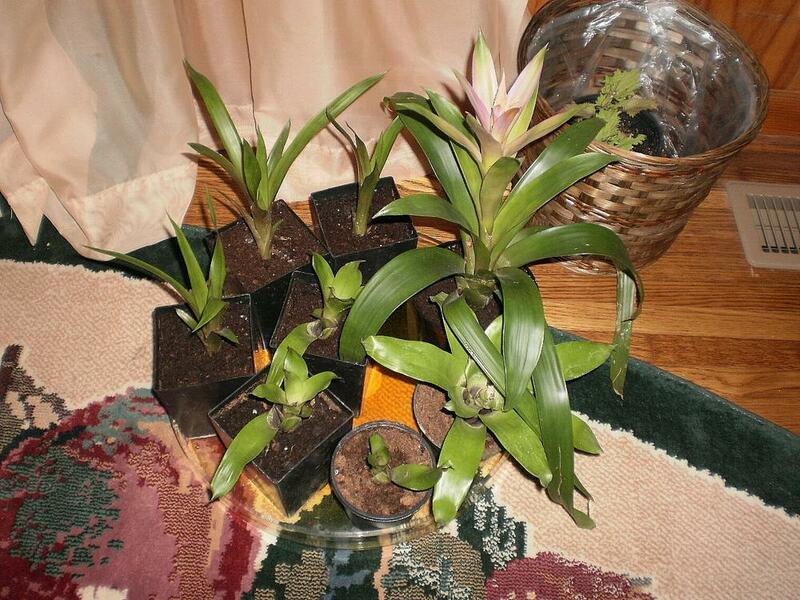 Bromeliads can be propagated in two ways: by seed (sexual reproduction) or vegetatively (asexual reproduction) which occurs when a bromeliad plant produces pups that can be separated to form individual new plants. 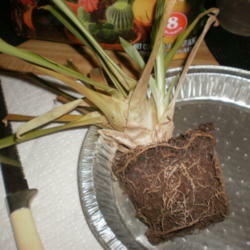 While I have never tried seed propagation of a bromeliad, I understand it is a long and tedious process. 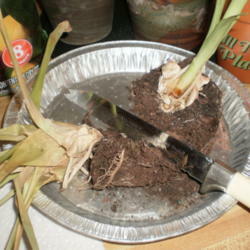 The second method is by far the easiest way for most of us to propagate these plants. 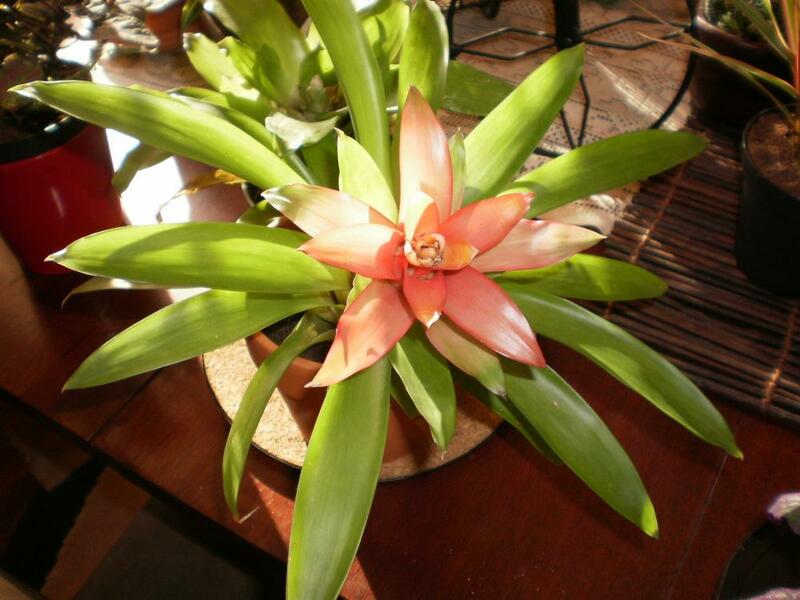 The orange bromeliad in the pictures below is a member of the Guzmania genus of bromeliads. 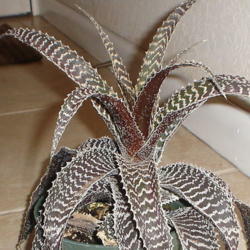 This genus is one of several genera that are sometimes called tank bromeliads due to the fact that the rosettes of broad leaves create a cup or vase, which provides a holding tank for water in the center of the plant. This tank should be filled with non-chlorinated water and never allowed to remain empty since tank bromeliads take in water and nutrients through the axils of the leaves forming the tank. Misting the plants is also very helpful if the air in your environment is dry or if you have a bromeliad that is not a tank type. Non-tank type bromeliads such as Dyckias, Cryptanthus, Tillandsias and some Neoregelias absorb much of the water and nutrients they need through fine hairs (trichomes) that cover the leaves. 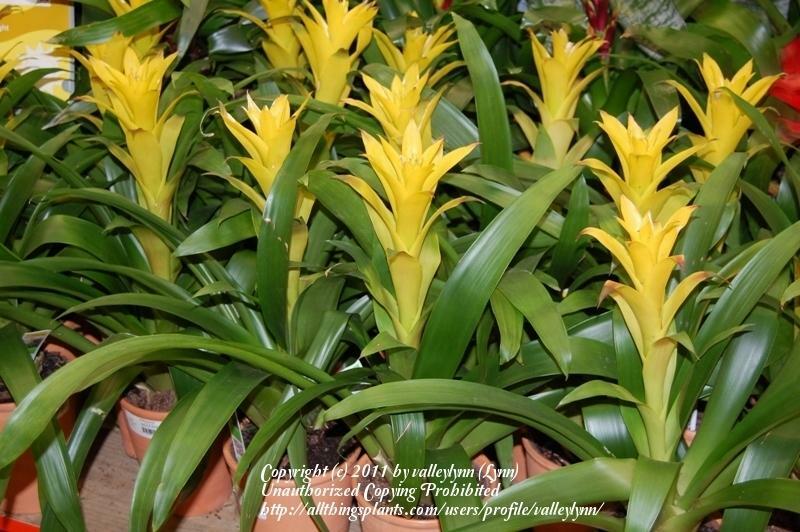 There are many genera of bromeliads and it is always helpful to consult a plant reference guide about the specific bromeliad you intend to grow in order to confirm its type and whether it is epiphytic or terrestrial in nature. The particular plant in the pictures was purchased over a year ago and bloomed for many months. 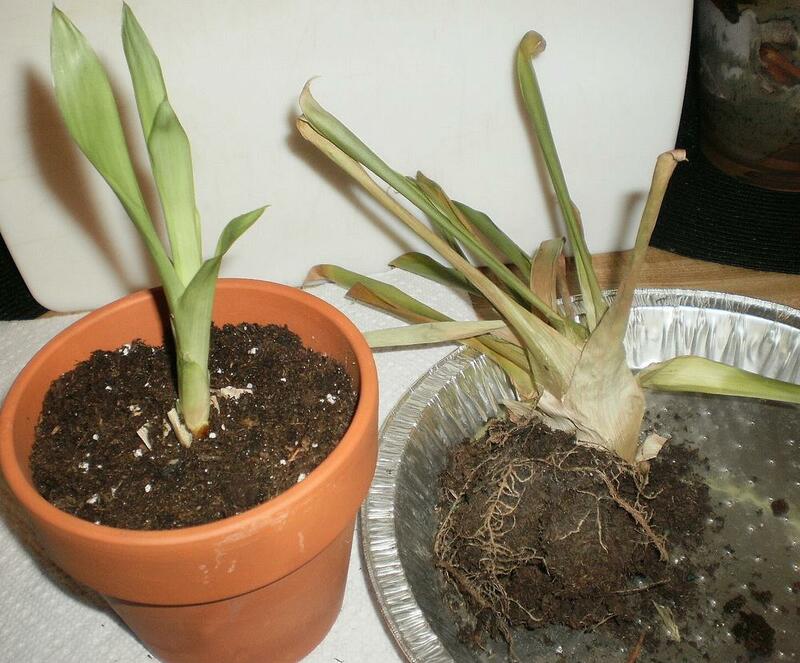 As the bloom died, the mother plant began to produce a new pup from its base (right photo). 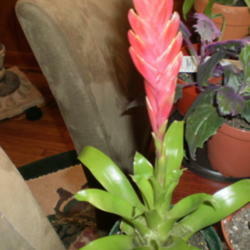 Bromeliads generally flower after 3-5 years of growth. The bloom lasts for a number of months and then dies. 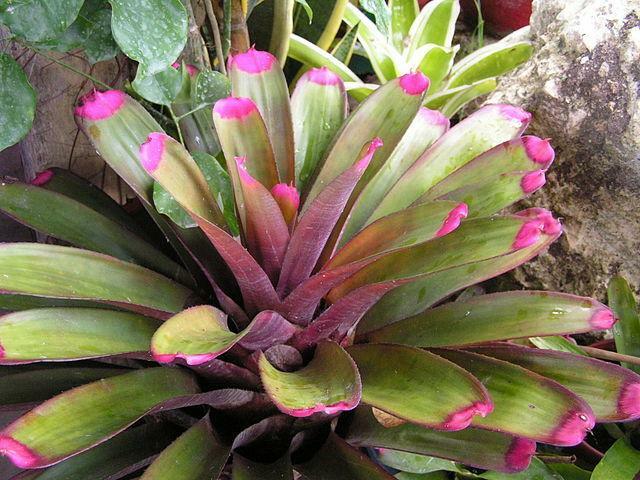 With a few exceptions, bromeliads are monocarps that bloom one time and die. 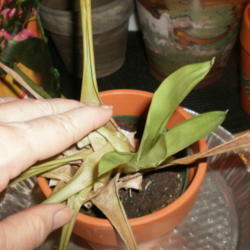 Therefore, within a year or two of blooming, the mother plant will also die, usually after producing one or more pups. 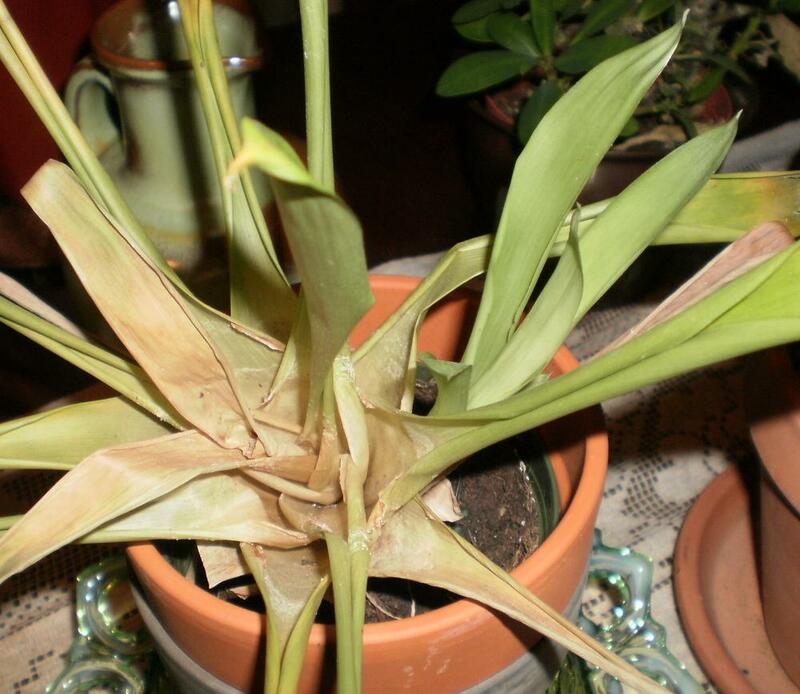 This is the natural life cycle of the plant and nothing to be alarmed about if a bromeliad appears to be dying after it blooms. It is. Once your plant develops a pup, let the pup grow to at least a third the size of the mother before attempting to separate it. 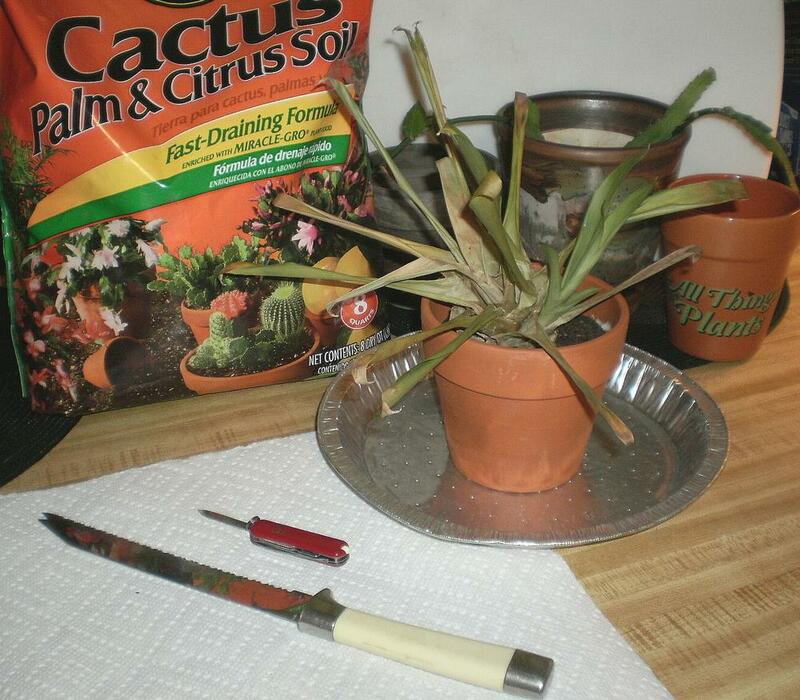 To remove the pup and establish a new potted plant, you will need the following items: a clean pot, planting medium and a sanitized sharp knife or small saw. I also like to have a second small, very sharp knife handy in case there is need for any additional delicate cutting or trimming. 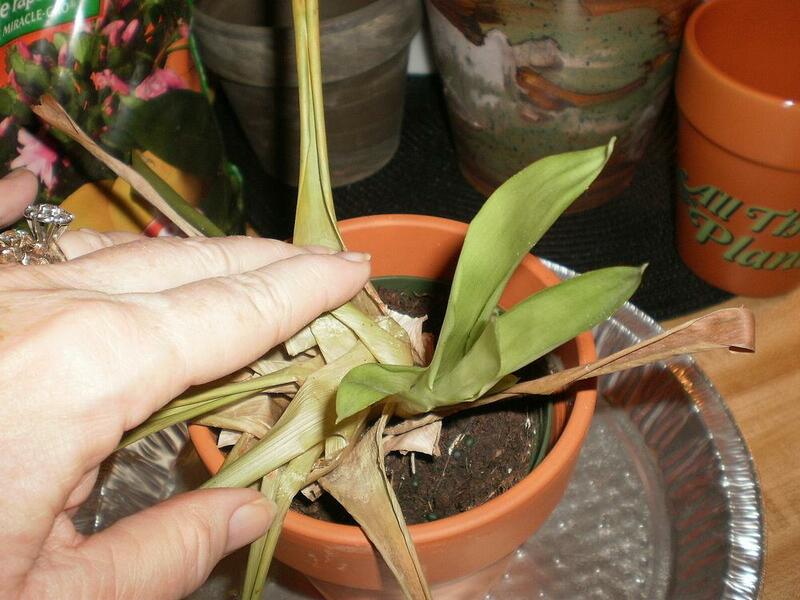 To begin, remove the mother plant from its pot and push back the leaves so you have a clear view of the area where the pup and mother are joined. Carefully place the knife between the mother and the pup and make a firm, clean cut straight down or slanted just a bit toward the mother if it is to be discarded. Use a slight sawing motion if you need to do so to get through the roots. At this point, you can return the mother to its pot and fill the hole left by the pup, or if the mother is almost dead, discard it. When making your cut, remember not to cut into or through the pup. This will kill it. And don't try to simply grab the pup and pull it away from the mother without cutting. 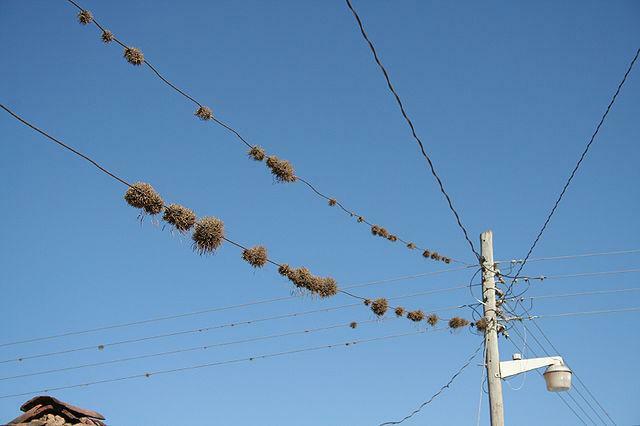 It is not necessary to worry too much about roots. The pup may separate with roots already attached or not. It's ideal if it does, but not critical. If the pup already has roots, plant it in the new pot making sure it sits at the same level in the substrate as it did in the old pot. Water, let drain well, and place it in an area of bright light out of direct sun. Leave it alone until the soil begins to dry out. Remember to keep water in the tank if there is one. 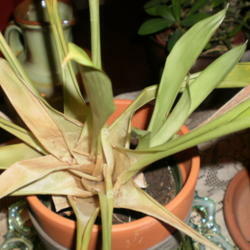 Epiphytic bromeliads like this Guzmania use their roots to anchor or attach themselves to things. In nature, that is often high in a tree. It appears this is the primary function of their roots and nutrient uptake is a distant secondary function; however, that is still being researched. So if the pup comes apart from the mother without any roots, don't despair and don't toss it away. All is not lost. It will form roots later. There are two main schools of thought about planting pups that have no roots. One school says go ahead and pot, propping up the pups until the roots develop to anchor them in the pot. 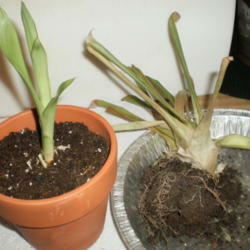 The other school advises leaving them alone until roots develop and then potting. Either way will work. Or you may have a method that works well for you. If you've had success, by all means stick with that. 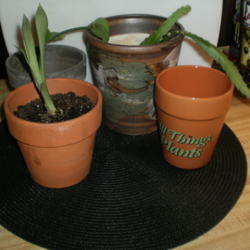 Regarding soil, potted bromeliads need a very fast-draining growing medium. 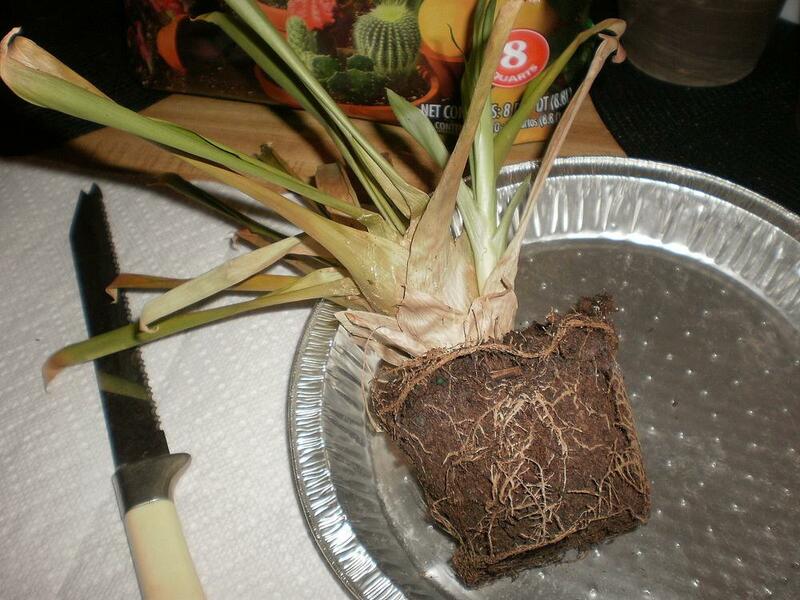 Regular potting soil will hold too much water and rot the roots. The genus, Cryptanthus, is perhaps the exception to the rule as that genus likes to be well-watered and doesn't seem to mind having wet feet. Commerical cactus and succulent mixes are available or you can also use small pine bark as your planting medium. A satisfactory homemade mix for bromeliads consists of one part good compost, one part coarse builder's sand, and one part perlite. Or even simpler, use two-thirds compost to one-third coarse sand. 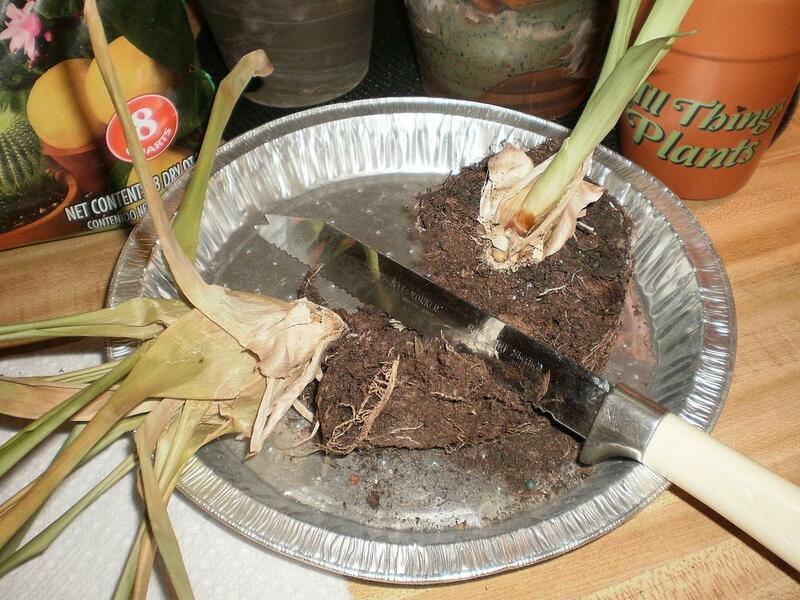 There are many recipes for bromeliad "soil" and most of them will work fine. Just avoid any that contain a lot of peat moss or other components that will hold too much water for too long a time. Whatever your substrate, it needs to be fast-draining and allow for sufficient air circulation around the roots. 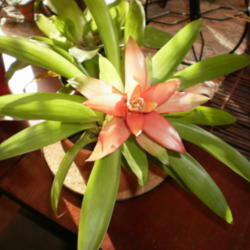 A bromeliad does not have a large root system and does not need a large pot. A 4-6 inch diameter is adequate. It is also helpful to plant a pup in a pot which can then be put into another pot as I have done here. 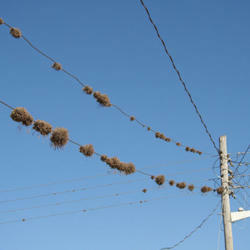 That will help stabilize the rather top-heavy plant as it grows. Clay pots are good for planting where growing conditions are humid since they are porous and dry quickly; plastic pots work well where the air is drier. In general, bromeliads are not heavy feeders. Use an acidic, water-soluble liquid fertilizer diluted to between one-quarter to one-half strength. Wet the leaves, potting medium, and roots when you fertilize. 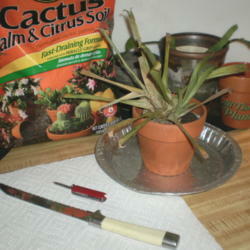 Rinse out the tanks of tank-type bromeliads from time to time to remove any accumulated salts left by the fertilizer. 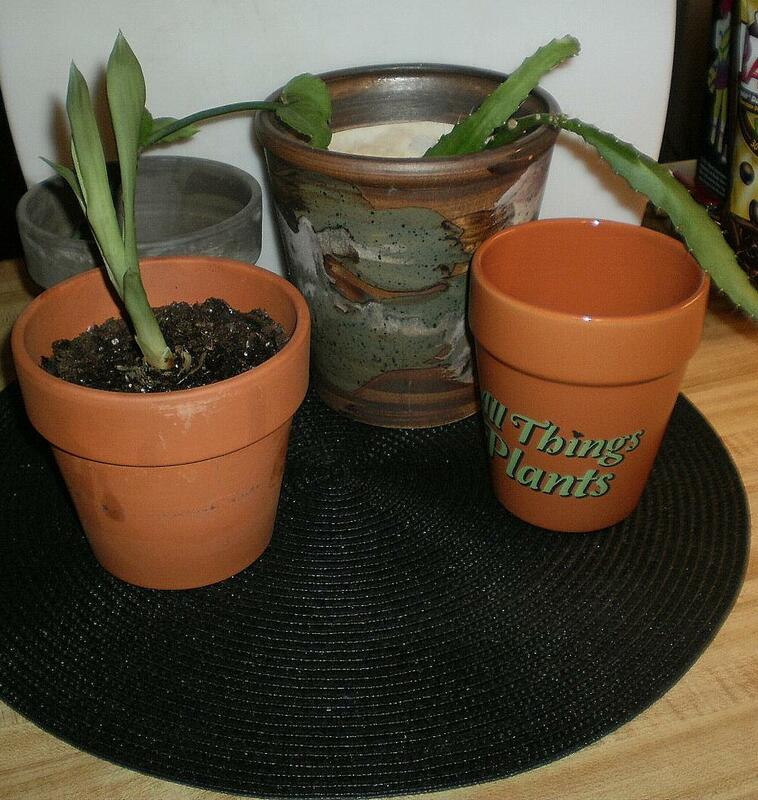 The photo below shows two mother plants along with the pups that were separated from them at different times. If a plant produces more than one pup and the mother is in good condition, separating the pups can be done at various intervals as each one reaches roughly a third to a half the size of the mother. In other words, separating and repotting pups doesn't all have to be done at once. And remember that if a mother plant still looks good, it can be put back into its pot to hopefully continue producing additional pups. 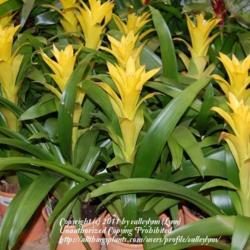 Bromeliads are not inexpensive plants. Although it will take several years for your pups to grow to maturity and bloom, the time is going to pass anyway. 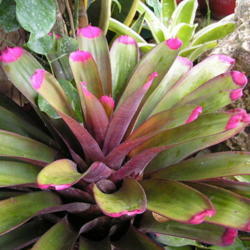 At the end of that time, why not have some beautiful- and free- bromeliad blooms to show for it? If you've had "separation anxiety" about them in the past, give this vegetative method of propagating these lovely, long-blooming plants a try. It's very likely you'll succeed. 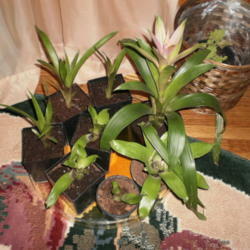 Bromeliads are not especially difficult to propagate and can put on quite a display.